Pro-democracy leader Aung San Suu Kyi said at her recent trial that the charges against her bring into question Burma’s judiciary and constitution, according a statement by her party, the National League for Democracy (NLD), on Monday. 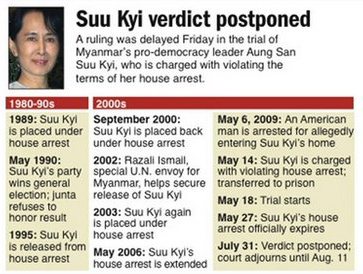 Suu Kyi reportedly said at the trial on July 24 that unless Burmese courts did something about her current period of detention, the current charge against her—harboring American intruder John W Yettaw—could not be examined "correctly and completely." “Equally critical is the principle that justice must not only be done, but must be seen to be done, clearly and unequivocally,” she said in the statement before the court. In her statement, Suu Kyi said that Yettaw entered her compound that she acted carefully so as not to endanger the intruder and the security guards who were responsible for preventing people from entering her compound. 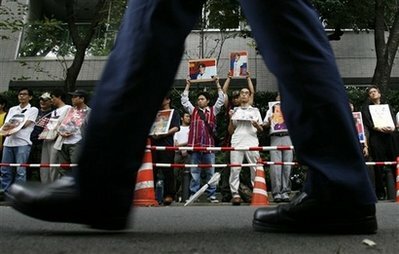 On Friday, the Rangoon Northern District Court postponed the verdict on Suu Kyi until August 11. The court said it had postponed the date of the verdict because the judges needed to review the law. Nobel Peace Prize laureate Suu Kyi, who has been detained for nearly 14 of the past 20 years, could face up to five years’ imprisonment if the court finds her guilty of illegally harboring the American.